For fusion Japanese and Peruvian food. What a unique combination! Stepping into Chotto Matte feels almost like stepping into a VIP club. The glossy black floor, the funky wall art, the disco ball like bulbs and the stylish diners all add to this high-end club like feel to the place. A special mention for the toilets- most interesting of any London hotel or restaurant I’ve ever been to. 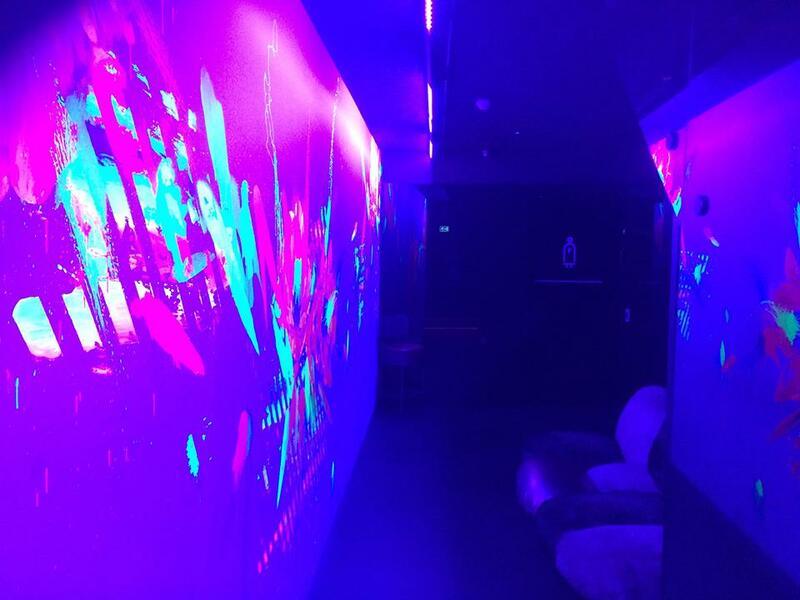 You are led to the toilets through a corridor with fluorescent lights projecting artwork onto the walls. Once inside, the cubicles themselves have all shiny, black doors but more importantly, are extremely heavy! I almost got stuck in the cubicle but was able to push after five, painfully long minutes of extremely wrestling with the door knob and panicking. 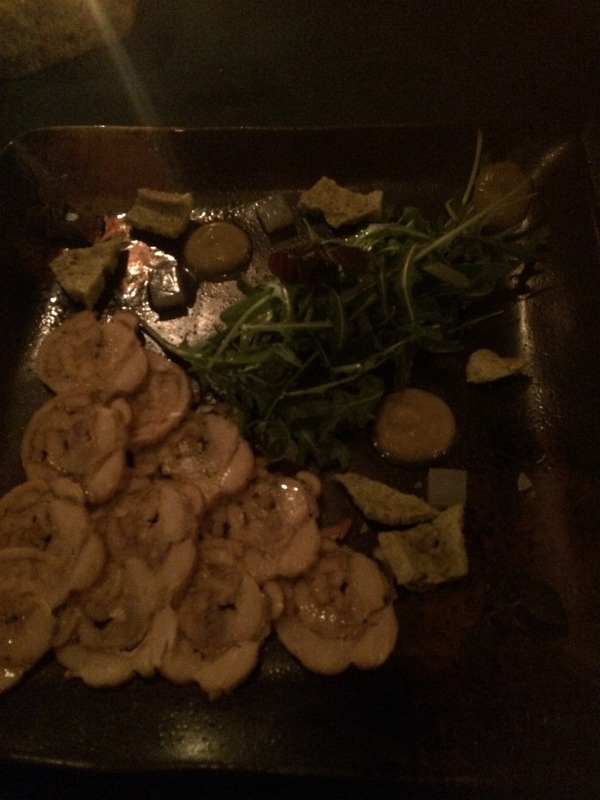 The dishes are all small plates – some primarily Japanese or Peruvian and some combining the two. Since we’d had Japanese as well as Peruvian on their own before, we decided to order the fusion dishes, i.e. those of Nikkei cuisine. 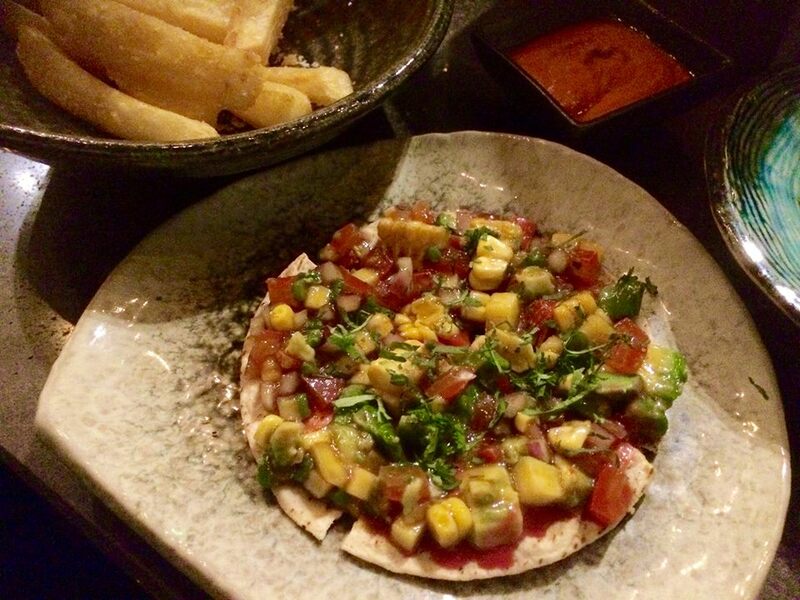 We started with the Tostaditas- small tacos but with a confluence of Japanese and Latin American toppings. First up was the Tuna Tostadita- with Tuna sashimi, jalapeno, coriander and wasabi. 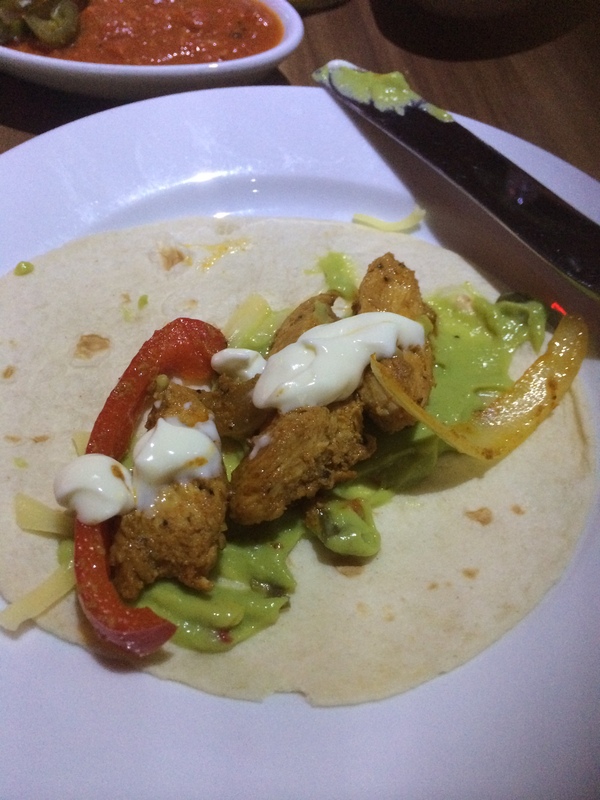 It was pretty amazing to see how all these different ingredients had been packed on top of one of little taco and also how well the flavours worked together. Our second one was the Tomato and Kumquat Tostadita with coriander and chive oil, which was as colorful and as fun a mouthful as the first one. Our next dishes were from the Nikkei BBQ section- the Pollo den miso and the Maize Huancaina. The Miso chicken came with a yellow chilli salsa and a fine slaw of carrot and daikon, which is a mild sweet-sharp Japanese radish. The Maize was cooked in coriander and garlic butter and served with a yummy cheesy dip. Our favourite dish, however, was the Barriguita de chanchito, which consisted of tender pork belly barbecued with Peruvian chilli peppers and garnished with a pear and tomato salsa. The pork was soft and superbly crisp-skinned and the marinade was absolutely gob-smacking. 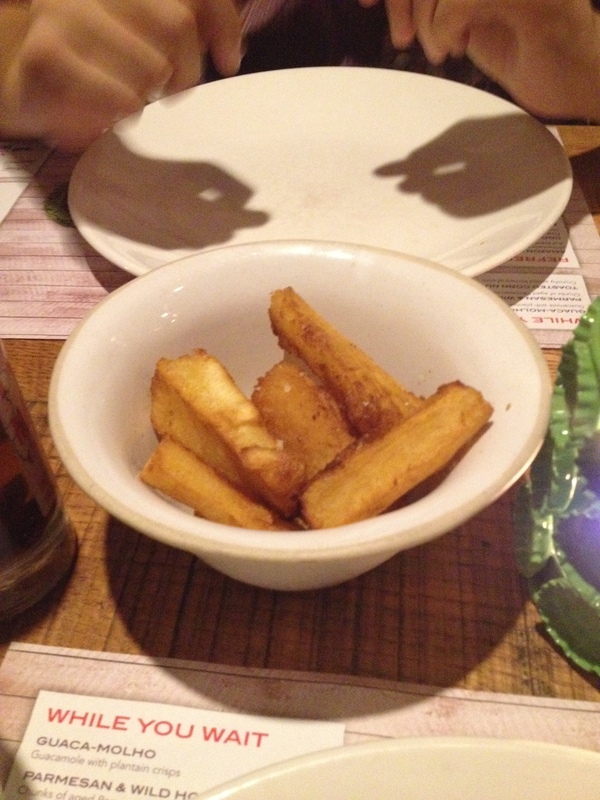 We also ordered some Yuca Frita, i.e. 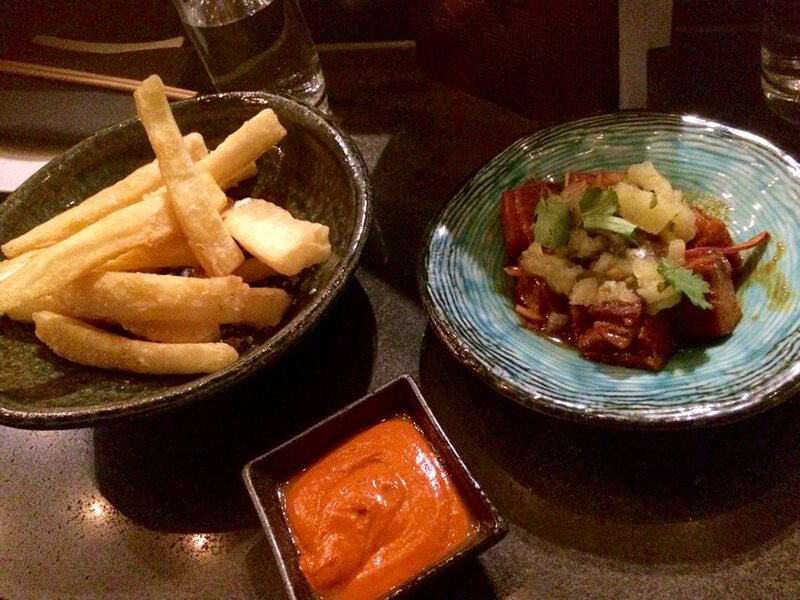 bowl of Cassava chips served with a smoked panca (Peruvian pepper) dip. These were some of the chunkiest and largest chips I’d ever had, not to mention very tasty, since Cassava is sweeter and more flavourful than potatoes. This is a good side because the rest of the dishes are pretty small. Nikkei cuisine is colorful and fun and very delicious. The extensive menu together with the unique dishes and the snazzy vibes of Chotto Matte, makes eating here a must-have dining experience. For gourmet Mexican food and their signature guacamole that they prepare for you at your table! They could have done a lot more with the decor of the place because when I think Mexican, I expect vibrant colors and happy music instead of the minimalist decor you find here. In spite of the venue being large and airy and being placed right in the centre of Covent Garden, the bare walls and the diner-style seating did feel a bit boring. Thankfully, they do put more effort into the presentation of the food than they did into styling that room. You can’t go here and not order the signature guacamole. The waitress brought over all the ingredients to our table. The avocados were smashed, the ‘secret’ spice added and lots of fresh garlic and cilantro thrown in. And just like that, the guacamole was ready in seconds! 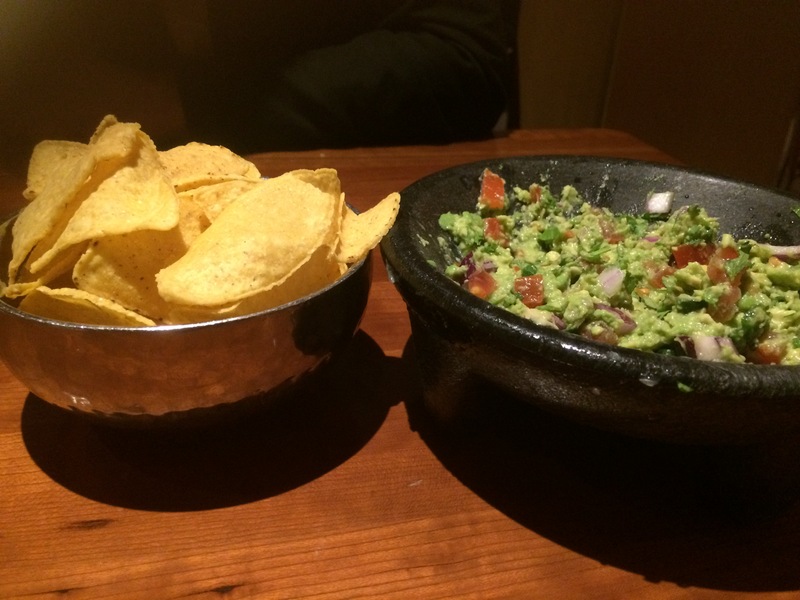 We were also served a large bowl of fresh warm tortilla chips to scoop up the delicious guacamole. I did ask the waitress if I could make the guacamole myself but she wasn’t too keen to let me play- probably a good thing in hindsight, since it would have taken me much longer. For mains, I ordered the Carnitas and the Mole Poblano. 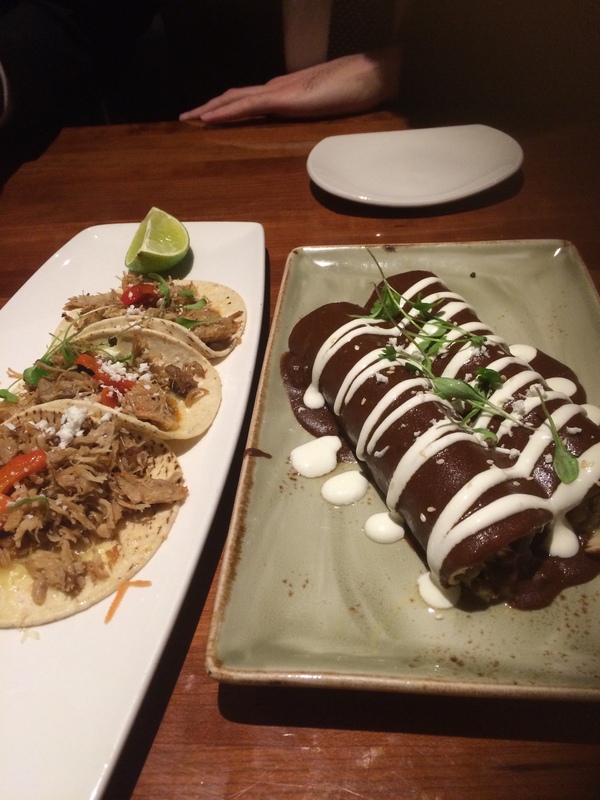 The Carnitas consisted of soft corn tortillas filled with roast pork in a chipotle & wine sauce and was topped with lots of fresco cheese while the Mole Poblano was a dish of chicken enchiladas with the chicken cooked in a traditional mole sauce made of over 16 ingredients including chocolate and dried chillies. The mole sauce was smooth and silky and the chocolate-chilli combo worked surprisingly well with the chicken. The Carnitas, however, felt a little dry and could have done with some more sauce in the filling or an accompanying dip, although the pork was definitely very flavoursome. 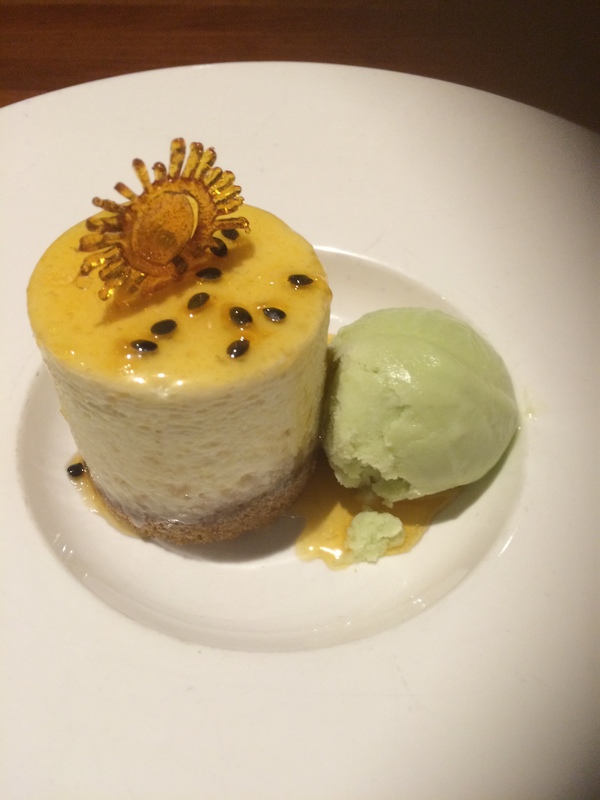 We finished with a Tequila cheesecake which was disappointing for me in spite of being a good cheesecake because you couldn’t actually taste the tequila at all! There could have been some tequila in there but the flavour was too subtle for me to pick up over the Madagascar Vanilla in the Mascarpone. 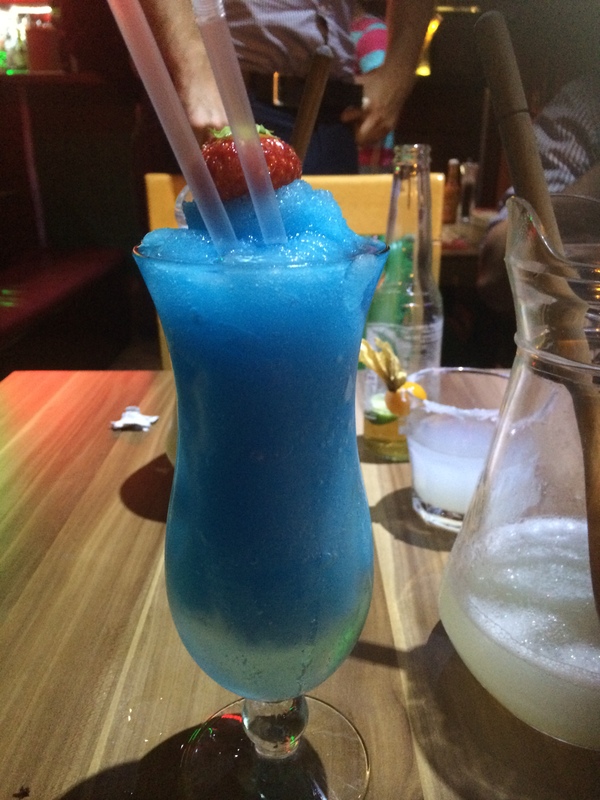 The Margaritas were decent, albeit a bit too sweet. 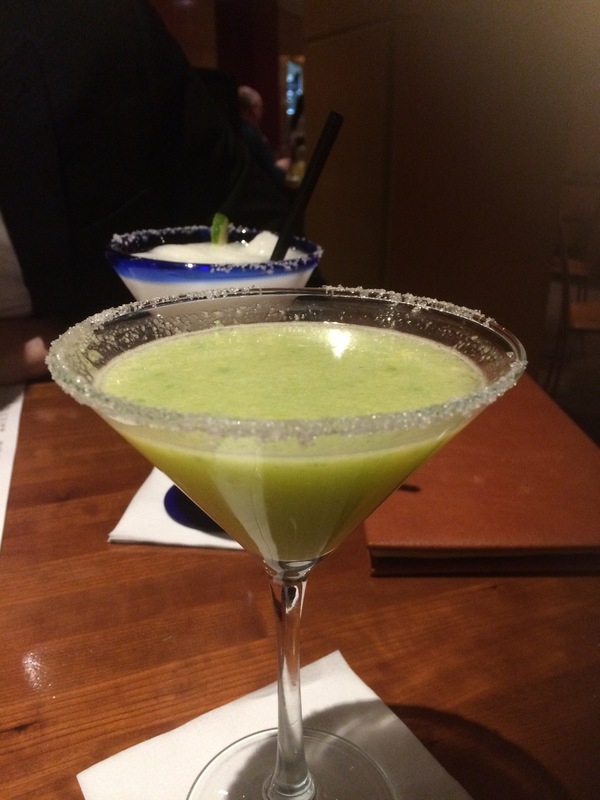 I ordered the Avocado Passion Margarita which other than being green, was identical to the standard Margarita and the avocado and passion fruit in there were again too mild to detect. The menu is extensive and some of the traditional dishes are done really well but the same can’t be said about the house specialties or the modern dishes on offer. So, if you go here, you are best advised to stick to the classics and to leave your urge for Modern Mexican for another day! To try exotic meats – there’s kangaroo to alpaca to crocodile on the menu. 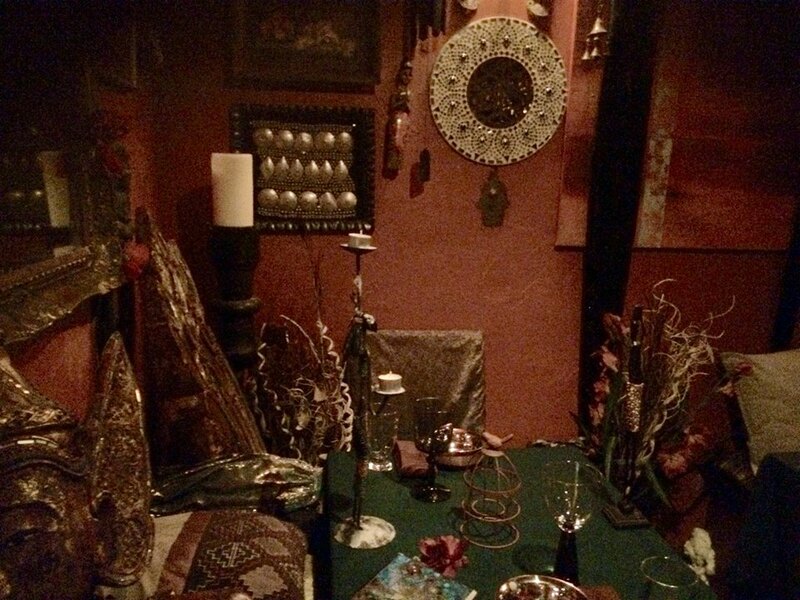 The restaurant is filled with cultural artefacts from all over the world. 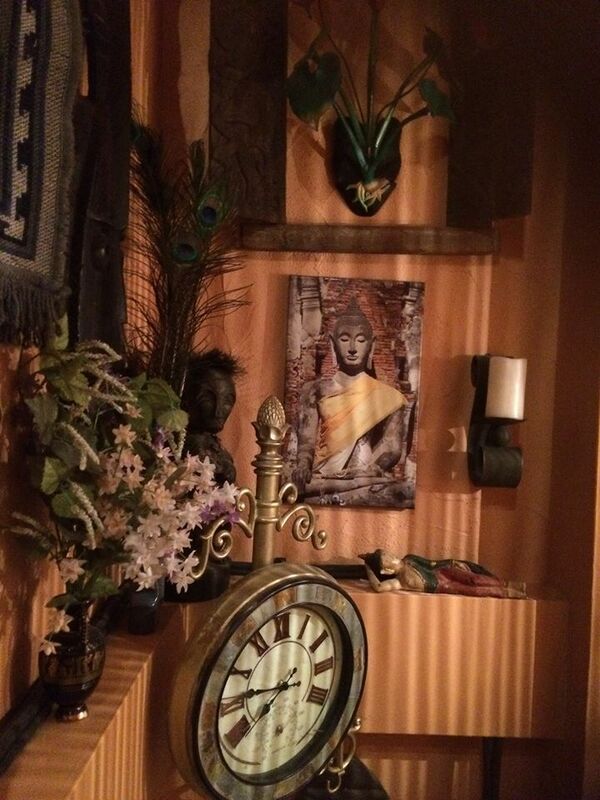 There are antiques like wooden giraffes, peacock feathers, Moroccan wall hangings and other random knick knack in every nook and corner of the place. You’ve got to be adventurous if you’re coming to eat here. While the menu does include some ‘safe’ dishes like the Massaman Chicken or the Malaysian-style Confit Duck, I was intent on trying the dishes I couldn’t get anywhere else. So, going in with that mindset, I ordered the Crocodile in Vine leaves and the Python Carpaccio for starters. The Crocodile meat was soft and flaky and was served with honey poached plums and pickled samphire, a crisp vegetable that grows in coastal areas. The Python looks like banana slices and tastes like chicken except much tougher. The accompanying green tea and wasabi crackers with olive puree were definitely the easier to digest components of the dish. 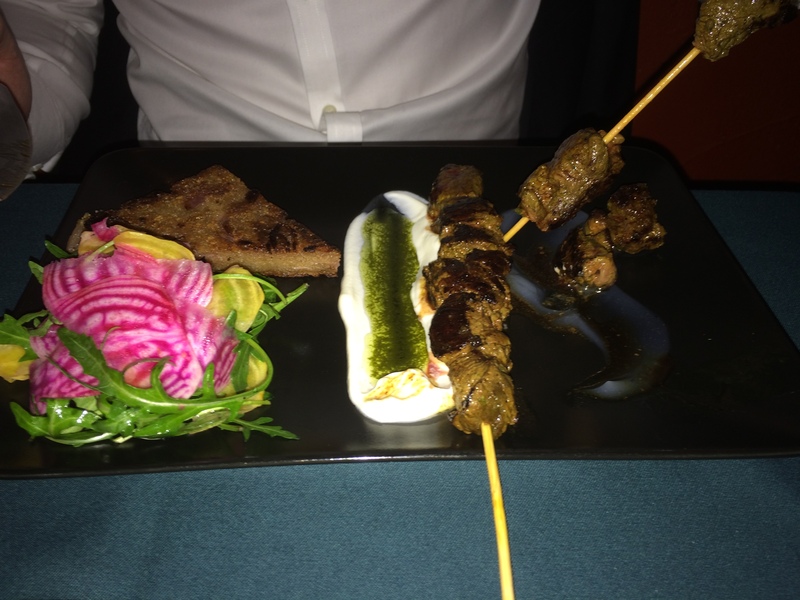 For mains, we tried the Kangaroo Skewers and the Jerked Alpaca. The kangaroo was marinated in an Israeli sauce made of peppers and garlic and was served with candied beetroot and a red onion farofa, which happens to be a Brazilian dish made with maize-flour couscous. 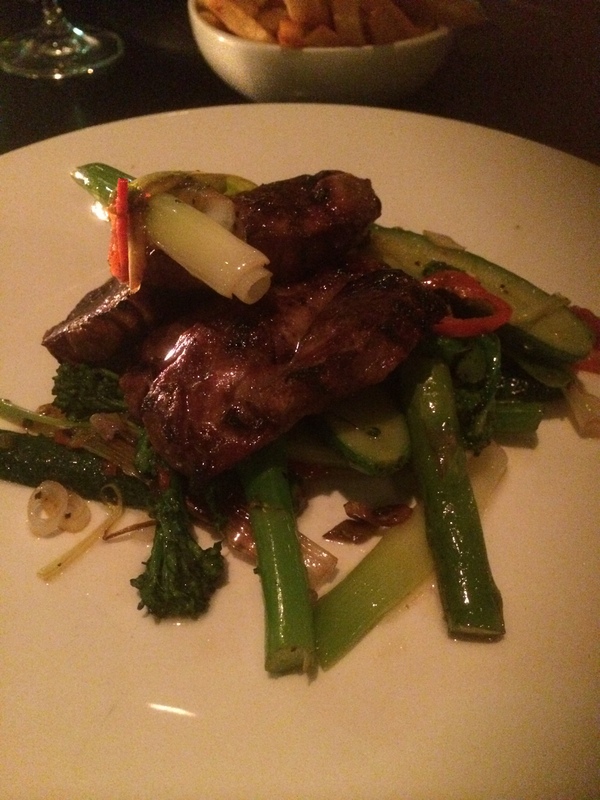 I found the kangaroo meat to be similar to lamb and quite succulent from the marination. 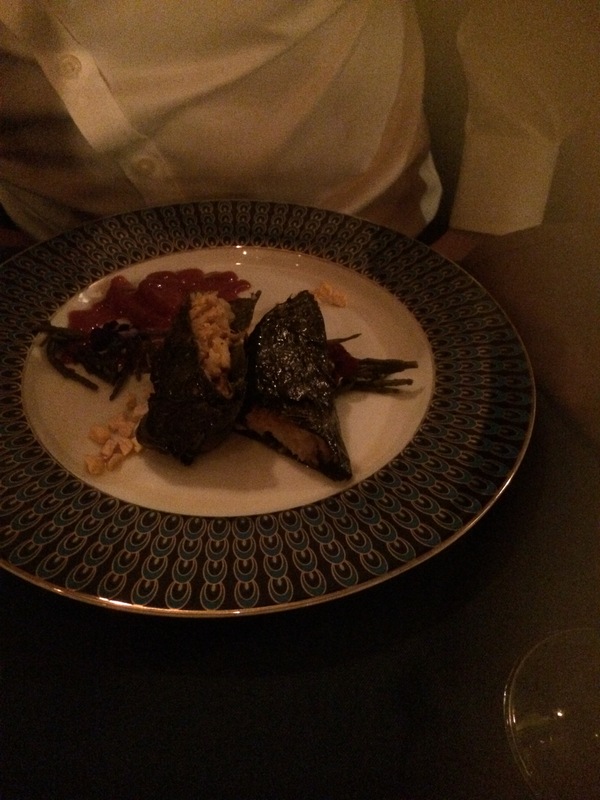 The jerked alpaca came wrapped in a leafy bowl and topped with a cornmeal slice. There were plantain chips or Patecones on side along with a slab of buttermilk jelly, which tasted very much like Tofu. The alpaca was pretty fiery but the heat was offset pretty well by the creamy cornmeal slice and the buttermilk jelly. 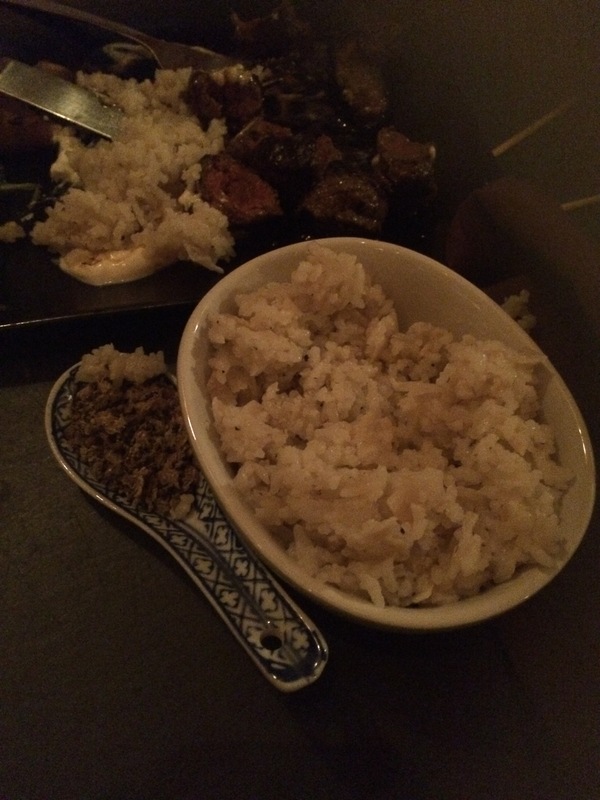 While we couldn’t brave the love-bug salad, we did order some coconut rice with a sprinkling of ants on the side, which were surprisingly nice and crispy and tasted almost like breadcrumbs. Dessert was the Medieval Hive, which consisted of brown butter ice cream served with a beautifully silky honey and butter caramel sauce and all topped with a baby bee, the latter of which I very kindly let my friend enjoy all to himself. 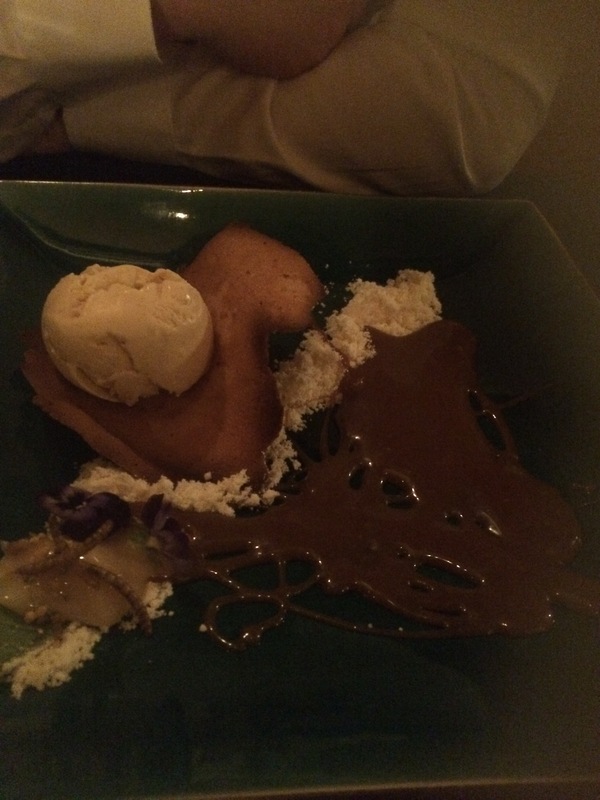 The ice cream and caramel sauce were to die for though! This place is a gem for all the adventurous foodies out there. The fusion of cuisines and the use of understated and unexplored ingredients makes the food here all the more fun. Dining here is definitely an experience and it explains why the restaurant has been referred to as one of London’s most romantic settings. Sister restaurant of the Lima, the first Michelin star Peruvian in Europe. So, you get lower prices but closely matched quality and innovation in the food. 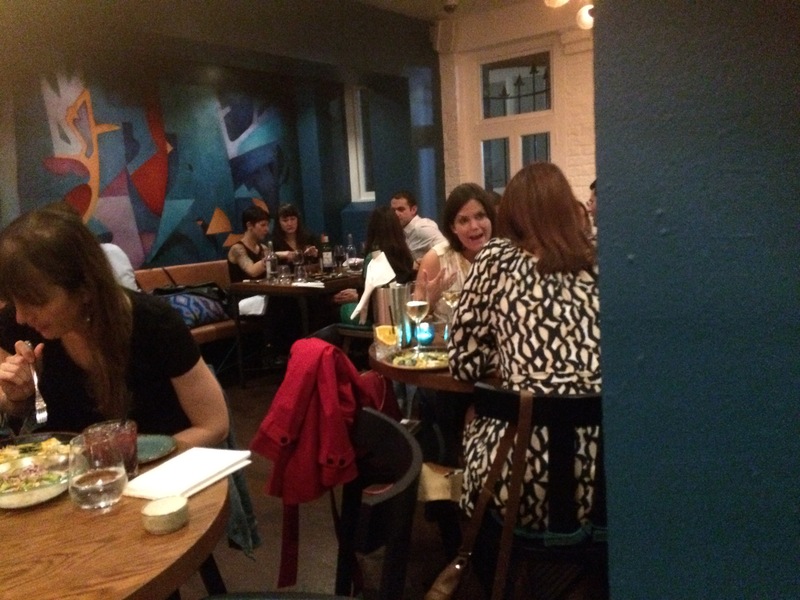 The place looks like a bistro in a navy blue and white theme and with a mural adorning one of the walls to add that Latin American touch. 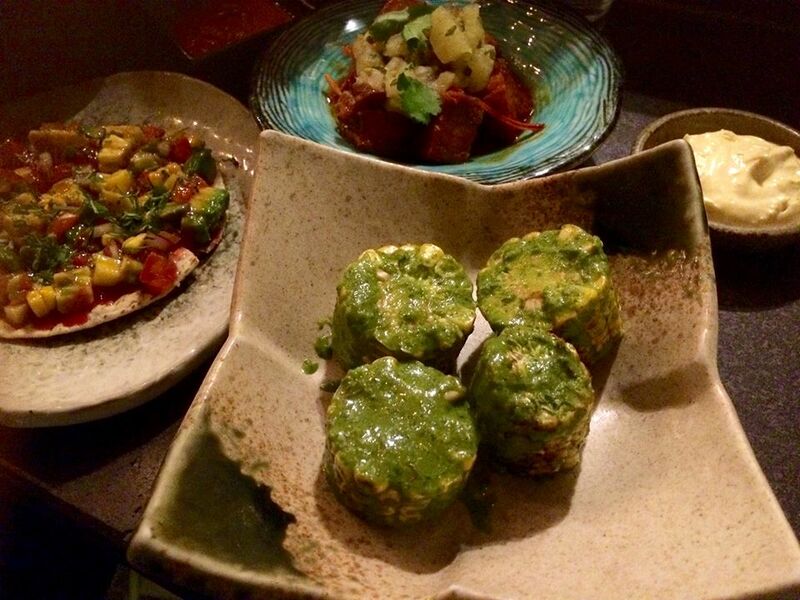 While London has quite a few noteworthy Peruvian restaurants, Lima Floral stands out because the focus of the menu is on the use of South American ingredients rather than on the standard Peruvian style of cooking such as with ceviches and anticuchos. You’ll instead find twists on European dishes through the use of exotic vegetables and herbs. 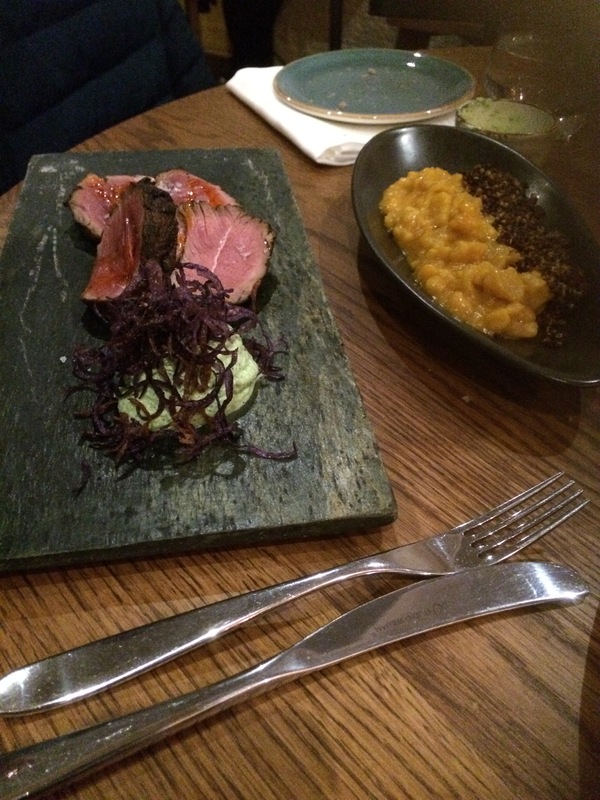 The lamb rump came with fluffy ‘eco dry potatoes’, black quinoa flavoured with the Huacatay herb and fresh Latin American cheese! The potatoes were definitely the star component for me. The sea bass ceviche with sweet potato and hot tiger’s milk was a welcome variation to the chilled raw seafood ceviche I’d had before and very beautifully presented too. 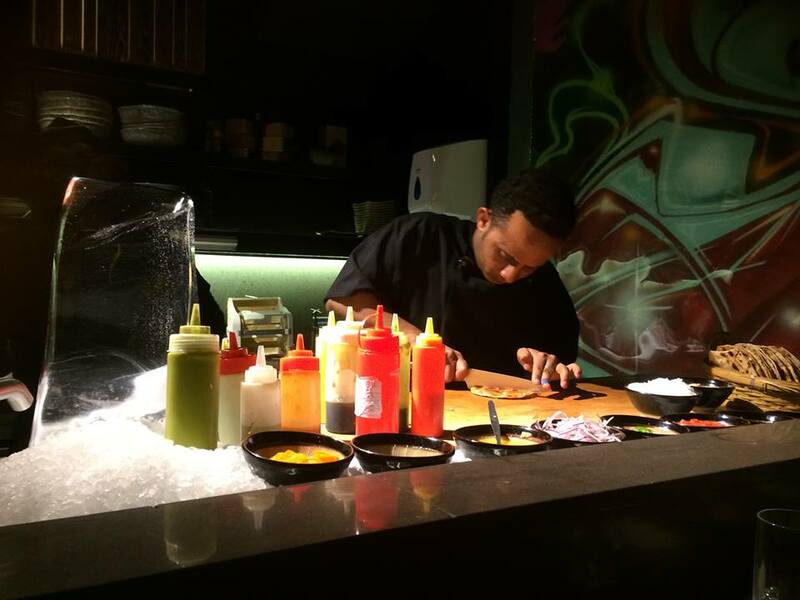 If you are looking to try Peruvian food made using real Peruvian ingredients incorporated into contemporary European dishes then this is the place to go. 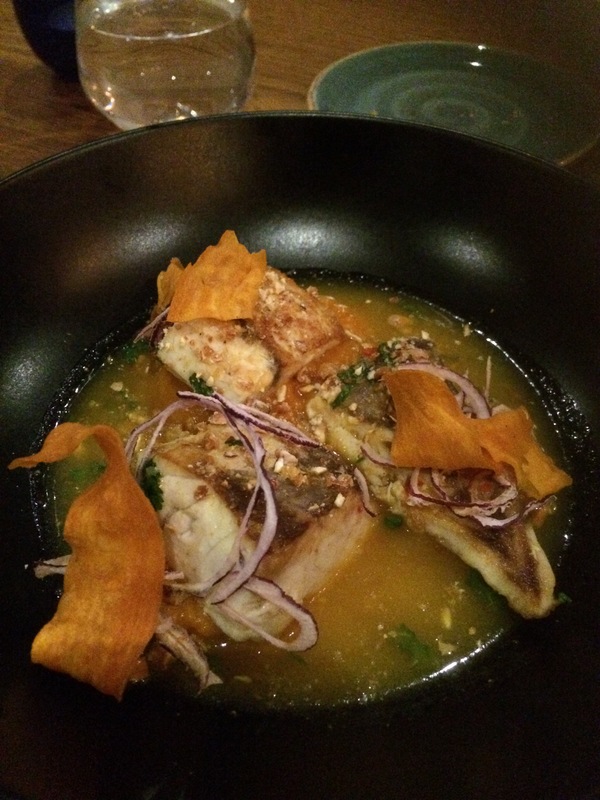 However, if this is the first time you’re planning to have Peruvian, it might be better to start with one of the more traditional Peruvian eateries to get better introduced to the flavours before moving onto the more subtly Peruvian dishes at Lima. For Mexican food served up in very big portions and for the sizzling table Fajitas that you put together yourself! Located in an alley just off Old Street, this Shoreditch Mexican eatery is colorful and cheery. The waiters were dressed in Mexican inspired waistcoats and there were sombreros and mini-guitars at hand for the guests to join in too! For starters, my friends and I ordered one of their combo tapas trays of which my favourite were the BBQ ribs, which were as sticky and saucy as you can get, though the jalapenos with oozing cream cheese were a very close second, but lost out on the first place due to being a bit too greasy! 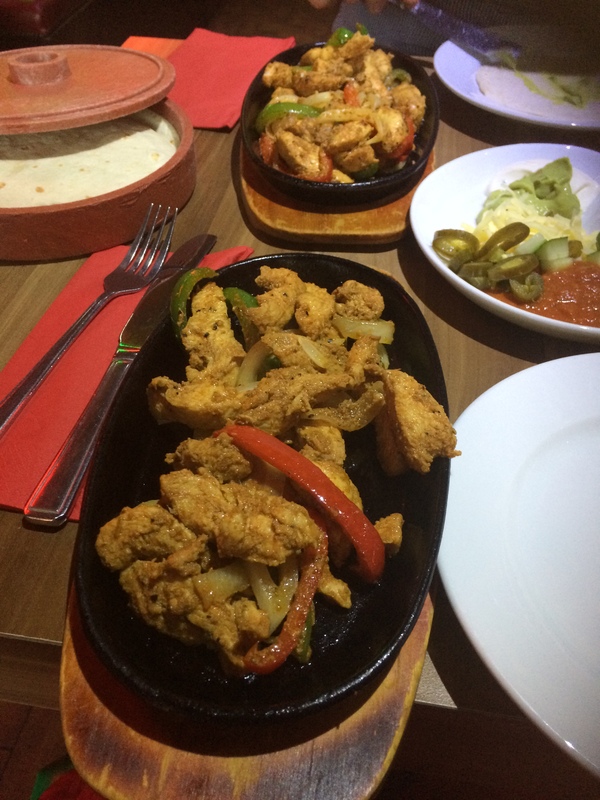 For mains, we all ordered the sizzling table Fajitas. While the task at hand isn’t the most complicated, make-your-own dishes are always such fun and can be quite messy depending on how drunk you are! The sizzling chicken was delicious but the ribeye steak seemed to be the winner amongst my friends, due to being more of a rarity when it comes to Mexican street food, not to mention more filling. For drinks, we all alternated between tequila shots and cocktails. My Blue Lagoon Tequila Fizz was the most intensely colored cocktail I’ve ever had but due to the amount of tequila I consumed that evening, the margaritas were more palatable. If you’re looking for tasty but value for money Mexican food and wouldn’t mind doing tequila shots and taking selfies wearing sombreros amidst your meal, this is the place to go. If you’re looking for Brasilian BBQ but looking for an al-a-carte style meal with manageable portions instead of the infinite buffet style used in most other Brasilian places, this is the restaurant to go to! The Stratford branch is somewhere between a cool wooden shack and a warehouse, with postered walls, overhead lighting using spiky baubles and footlong chains making up curtains. Relaxed, easy going feel overall. My Pork Tenderloin dish was tender and well-marinated with chimichurri sauce. The melting, golden parmesan crust on top balanced the heat from the chimichurri while adding to the texture. The Picanha Burger is one of the most eats if you visit this joint- juicy Brasilian steak with chilli mayo and black beans and the extra of pulled pork is highly recommended! 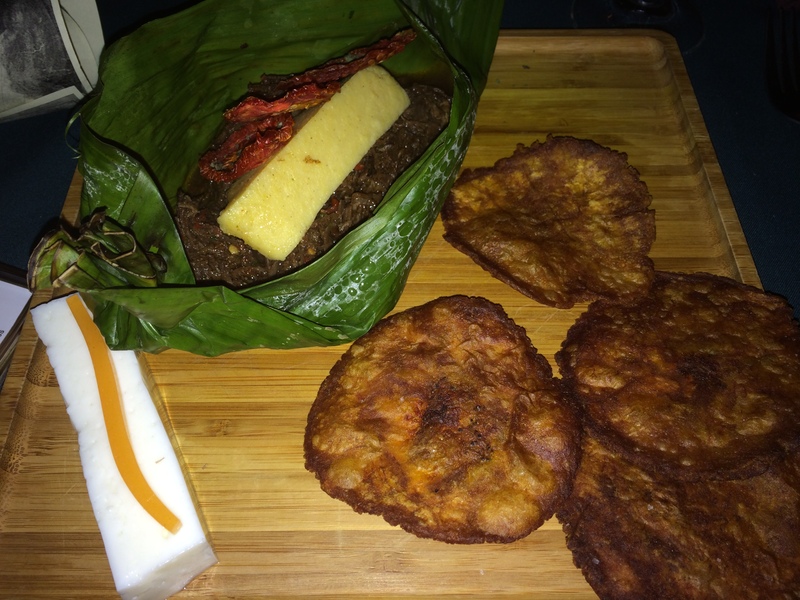 Our side of cassava chips went well with both dishes. 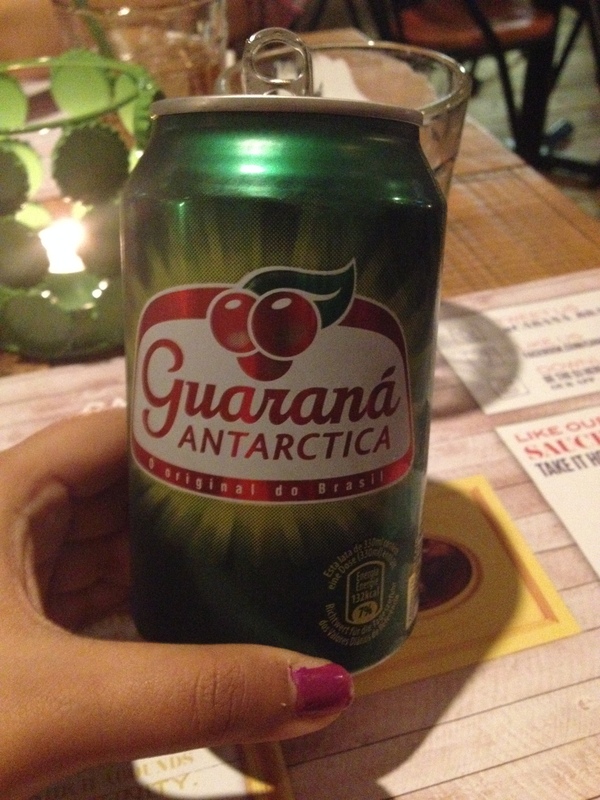 My drink was a Guarana Antartica, Brazil’s version of Pepsi/Red Bull apparently, which unfortunately was too bland for my liking. But fear not, the place has a very good range of cocktails, of which the fruity cahaca ones (hint: the Red Tail Parrot) are really refreshing. Go if you’re looking for well done, not-too-spicy yet flavoursome Brasilian dishes in a laid back setting. But if you have a massive appetite, a traditional buffet style Brazilean restaurant might be a better deal for you. For the steak, sourced all the way from Argentina. The waitress even gives you a little walkthrough of the different cuts available and gives her recommendations on how they should be had – well done, medium or rare (although my friends forgot her recommendations soon after she left, information overload apparently). 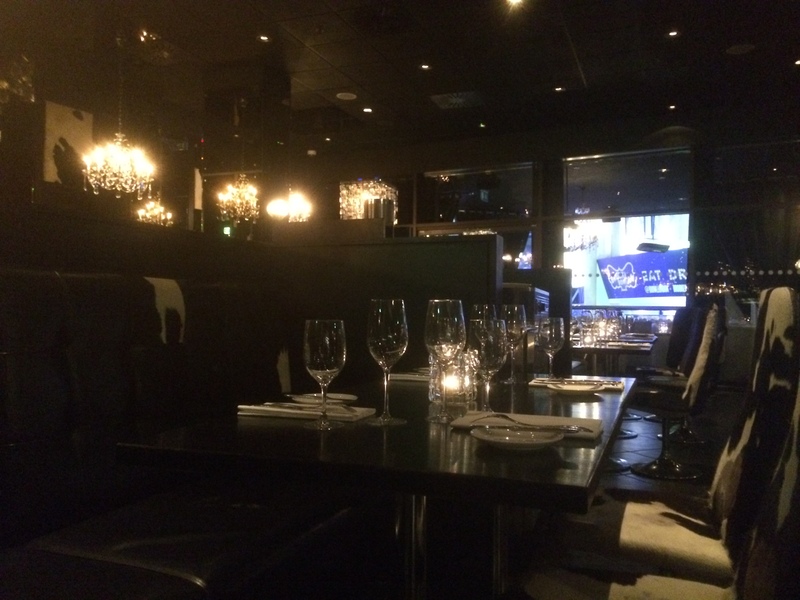 The restaurant is dimly lit and kitted with plush couches and velvet curtains. Would be good to have some instrumental music in the background to add to the feel because we almost felt guilty every time our cutlery touched our plates and were whispering to avoid being overheard. I should mention here that we visited the restaurant at about 9 pm, so maybe they did have music on earlier.. I tried the Ecuadorian Ceviche since I wanted to compare it to the Peruvian ceviche I had tried before. 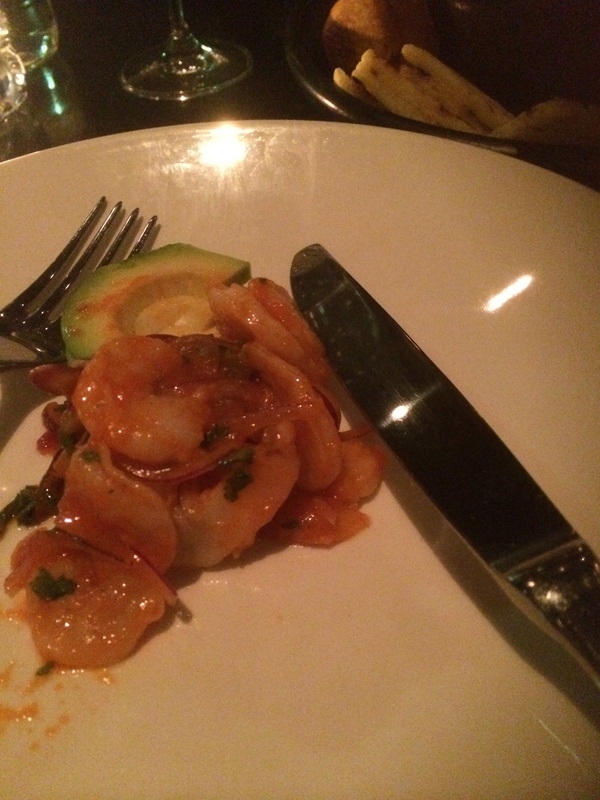 The main difference is with the tiger’s milk being replaced with a roasted tomato and pepper sauce with onion, that reminded me of Italian flavours but the chilled prawns and the cool, creamy avocado slices definitely positively set it apart. For mains, I opted for the Braised Shoulder of Lamb. The lamb shoulder was of a very generous cut.and cooked perfectly, so that the skin outside was crispy while the meat inside was a dark onion pink and oh so juicy! The side of glazed broccoli and celery wasn’t bad but a sauce/puree might have made a better accompaniment since the long celery sticks were tricky to eat and every time I spent 3 minutes chewing on one of those sticks, I was missing being able to tuck into that succulent lamb. But if you’re not as impatient as me, this won’t bother you. 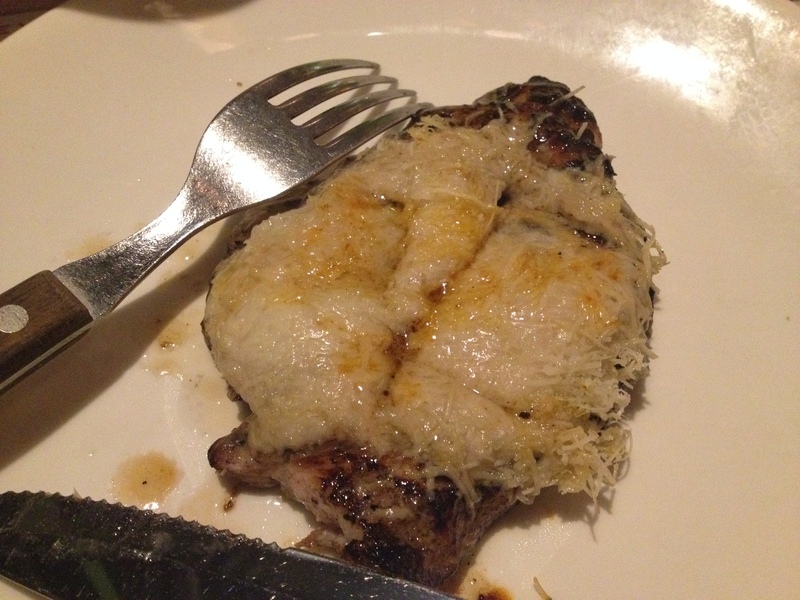 Argentinian steak and other Latin American dishes executed with a few but quality ingredients. Must visit if you like steak but not if you’re looking to try typical South American cuisine, since the choice with dishes beyond steak is limited.